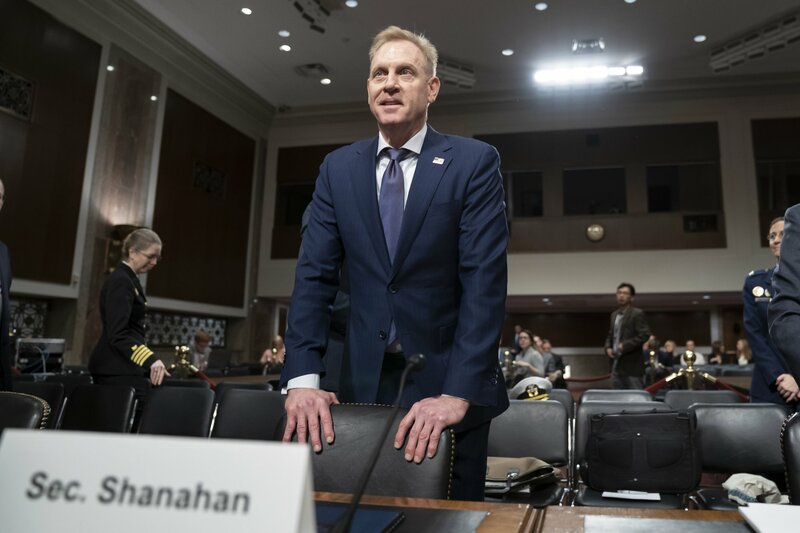 The U.S. is still fighting small wars against Islamic extremists, and Russia remains a serious concern, but Shanahan seeks to shift the military’s main focus to what he considers the more pressing security problem of a rapidly growing Chinese military. This theme, which Shanahan outlined Thursday in presenting the administration’s proposed 2020 defense budget to the Senate Armed Services Committee, is competing for attention with narrower, more immediate problems such as President Donald Trump’s effort to use the military to build a border wall. Shanahan is hardly the first defense chief to worry about China. Several predecessors pursued what the Obama administration called a “pivot” to the Pacific, with China in mind. But Shanahan sees it as an increasingly urgent problem that exceeds traditional measures of military strength and transcends partisan priorities. “China is aggressively modernizing its military, systematically stealing science and technology, and seeking military advantage through a strategy of military-civil fusion,” he wrote in prepared testimony to the committee, which is considering a $718 billion Pentagon budget designed in part to counter China’s momentum. The $25 billion the Pentagon is proposing to spend on nuclear weapons in 2020, for example, is meant in part to stay ahead of China’s nuclear arsenal, which is much smaller than America’s but growing. Shanahan said China is developing a nuclear-capable long-range bomber that, if successful, would enable China to join the United States and Russia as the only nations with air-, sea- and land-based nuclear weapons. Shanahan ticked off a list of other Chinese advancements — hypersonic missiles against which the U.S. has limited defenses; space launches and other space efforts that could enable it to fight wars in space; “systematically stealing” of U.S. and allied technology, and militarizing land features in the South China Sea. “It is overdue,” she said of the Shanahan focus. “We have been somewhat slow in catching up” in such areas as denying China its regional ambitions, including efforts to fully control the South China Sea, which is contested by several other countries. “I do think it’s worth asking what exactly is threatening about China’s behavior,” said Christopher Preble, vice president for defense and foreign policy studies at the Cato Institute. He doesn’t discount China as a security issue, including in the South China Sea, but doubts the U.S. military is the institution best suited to deal with such non-military problems as cyber intrusions into American commercial networks. In his previous role as deputy defense secretary, Shanahan and President Donald Trump’s first defense secretary, Jim Mattis, crafted a national defense strategy that put China at the top of the list of problems. “As China continues its economic and military ascendance, asserting power through an all-of-nation long-term strategy, it will continue to pursue a military modernization program that seeks Indo-Pacific regional hegemony in the near-term and displacement of the United States to achieve global pre-eminence in the future,” that strategy document says. Next Next post: Is Chelsea Clinton Islamophobic now?